How Do Metallurgists Measure Toughness in Metal? What's the difference between toughness, strength, and hardness? Toughness is a measure of how much energy a metal can absorb before rupturing or fracturing. It also relates to the ability of the metal to bend without breaking. What's the Difference Between Toughness, Hardness, and Strength? Toughness, hardness, and strength sound like similar qualities. In fact, while both measure a metal's ability to stand up under stress, they are very different from one another. Toughness measure's a metal's ability to maintain its integrity while being pressed, pulled, or deformed. A metal that can be bent without breaking is tougher than a metal that will break rather than bend. Hardness is a measure of a metal's ability to withstand friction and thus avoid abrasion. A diamond, for example, is very hard. It is very difficult to scratch the surface of a diamond. But a diamond is not particularly tough, as it can be easily smashed by a hard impact. Strength is a measure of the amount of force required to bend a metal. Some metals are easily bent and are thus valuable for jewelry and similar uses. Others are extremely strong and are thus valued for use in large structures. It is possible for a metal to be tough, hard, and strong -- or any combination of the three qualities. When selecting a metal for a particular use, metallurgists look for an appropriate combination of toughness, hardness, and strength. In many cases, metals are alloyed with other metals to add, for example, hardness to a tough metal or strength to a hard metal. While not technically a toughness test, material toughness is most commonly measured by an impact test known as a Charpy V-notch test (CVN). 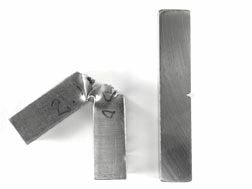 In standard CVN testing, a 10 mm x 10 mm square bar has a small "V"-shaped notch machined on one face. A hammer swung from a large pendulum will strike the side opposite the notch. If the metal does not break, the level of energy is increased until the metal breaks. Once the Charpy impact machine breaks the bar, the amount of energy required to cause the rupture is recorded, giving a measurement of toughness in pound-feet.